Yesterday my boyfriend and I celebrated Valentine’s Day early with a trip to Godiva. The only thing I can have without problem at Godiva are the chocolate covered strawberries (WHICH ARE DELICIOUS!). So the plan was to get some of those. Then we stumbled upon the little candy boxes that they have filled with little truffles or speciality chocolates for Valentine’s Day. One of the delectable treats there were Strawberry Champagne Hearts. A Strawberry Champagne Heart is strawberry ganache blended with a hint of champagne in a white chocolate shell. Can you say MMMMM! We decided to get those they are very very yummy. These little treats got me thinking about creating a cupcake to replicate the yummy flavor found in the little heart! 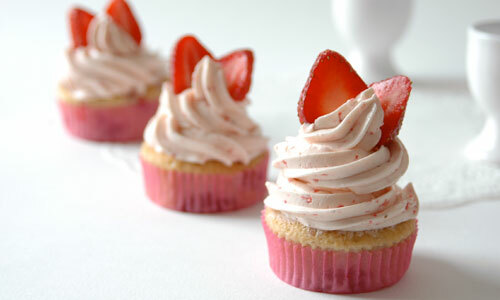 I give you , Strawberry Champagne Cupcakes! In a large bowl, sift together gluten free flour, baking powder, baking soda, and salt. In a separate bowl, whisk together coconut milk, champagne, strawberry puree, sugar, vanilla, and oil. Make a well in the center of the dry ingredients and pour in the wet ingredients. Mix until relatively smooth. Fill cupcake liners with a scant 1/4 cup of batter (cups should be just under 2/3 of the way full). Bake for 18-22 minutes or until set, and toothpick inserted in the center comes out clean. Transfer to cooling rack and allow to cool completely. Bring champagne to a simmer in a small saucepan. Continue to boil gently until only 2-3 tablespoons of liquid remain. Remove from heat and set aside to cool. For frosting, cream vegan butter in electric mixer for 1-2 minutes until fluffy. Slowly add 1 cup sugar and beat until smooth. Add 2 tablespoons reduced champagne and mix. Continue to add confectioners’ sugar, 1/2 cup at a time, and beat until light and fluffy. Add coconut milk or more sugar as necessary to achieve proper consistency. Pipe or spread onto cooled cupcakes.